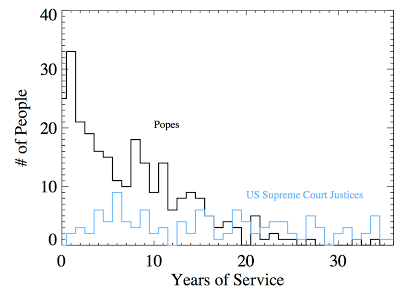 If We Assume: How long do Popes usually serve? How long do Popes usually serve? For those of us young enough to not remember a time before Pope John Paul II, the 8-year reign of Benedict XVI feels particularly brief. I then wondered: how many years on average does a Pope reign? The average duration turns out to be... 7.3 years (median of 6 years). Additionally, there's no strong increase in length of reign over time. 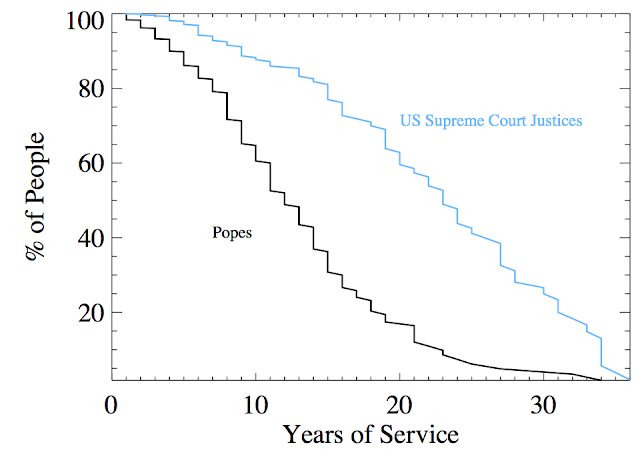 In other words: despite lifespans increasing, Popes still tend to have a short tenure. It appears Benedict XVI really isn't too far off the average! I then thought to compare these numbers with another distinguished group of (historically) men: Justices of the Supreme Court of the United States. Fun fact: there have been a total of (including those currently serving/reigning) 113 Supreme Court Judges, compared to 264 Popes. These justices have an average service on the bench of 16.4 years (median 16 years)! To further compare these two populations of people, I have reverse-sorted their durations of service into cumulative distributions. The way to read this diagram is: 60% of Popes reign 10 or more years, and less than 20% of Popes serve 20 years or more. By contrast, 65% of Justices serve 20 years or more. 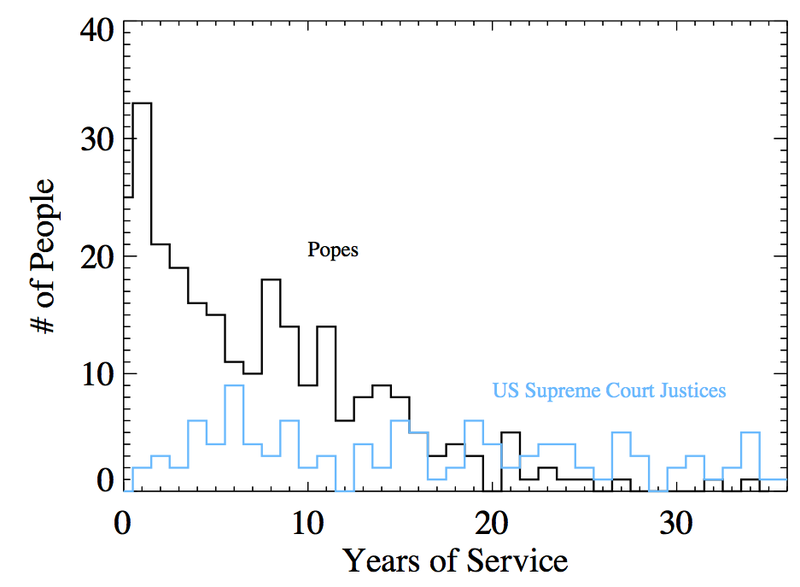 Cumulative distribution for the years of service of Popes and US Supreme Court Justices. I have computed a similar analysis for US Senators, who since 1950 serve an average of 11.8 consecutive years! Could you please publish the dataset you used? From 1800 to 2013 there were 15 popes, and their average is 14.2 years. The overall average is interesting as trivia, but the modern life expectancy means 14 is a better answer. Just saw this really interesting info. Since Pope Benedict resigned at age 85, I thought it was interesting that (since 1800) only one pope has actually live past 85 - Pope Leo XIII dies in 1903 at age 93. Overall, the average age of death (since 1800) was 78 (77 starting at 1900 and 79 if you include Pope Leo XIII). So I think getting to 85 is pretty impressive.